For more information and enrolment details please visit SolarQuip’s online registration website. Paul Wilson from Arvio explaining how the Kilowatt Labs supercapacitor works. 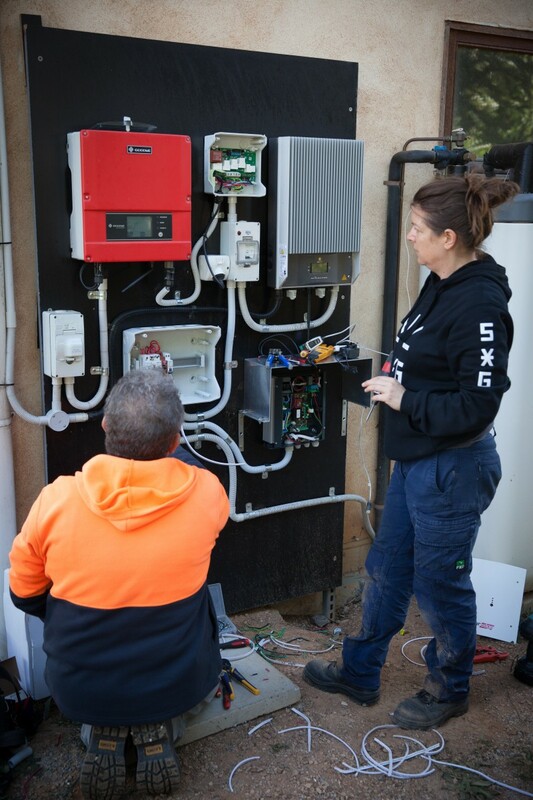 Fotakis & Rachel working on the PV water heater demonstration system. Top is the EasyWarm VoV system and directly below is the new SolarEdge 3.6kW Immersion Heater diverter. 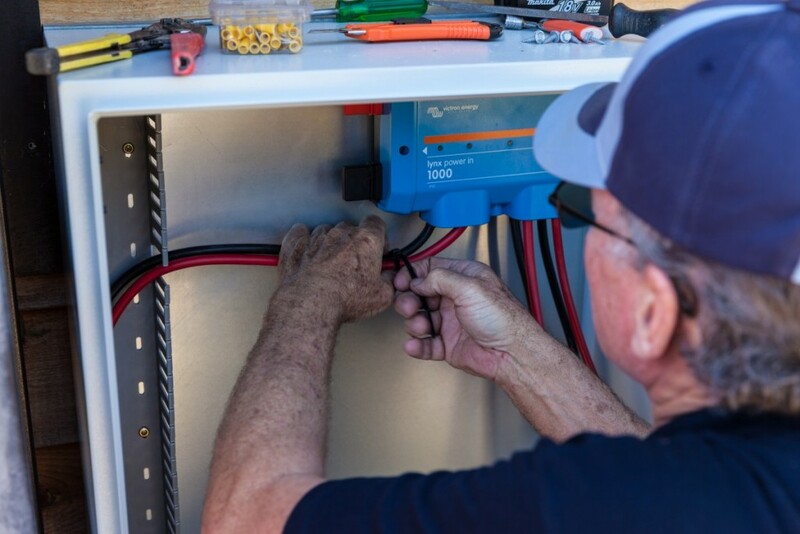 Adam and Saxton working on the Goodwe BP (dc-dc) converter that allows retrofitting of battery storage to an existing PV system easy by connecting storage to the PV d.c. side of the system. Scott and Ian installing an extra 6kWh of GenZ lithium-ion battery storage to the Tiny House’s “GiantPower system”. 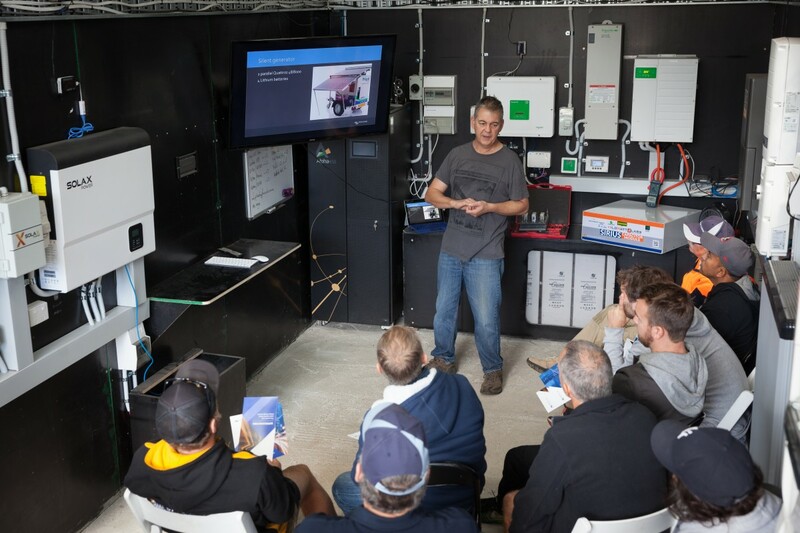 Phil Crotty from Victron Energy showing the students the features and advantages of the Victron system. Norm Anderson, CEO of Energy Smart Water, talking about their MyPV d.c. water heating system and the new AC.Thor 6kW a.c. power diverter. 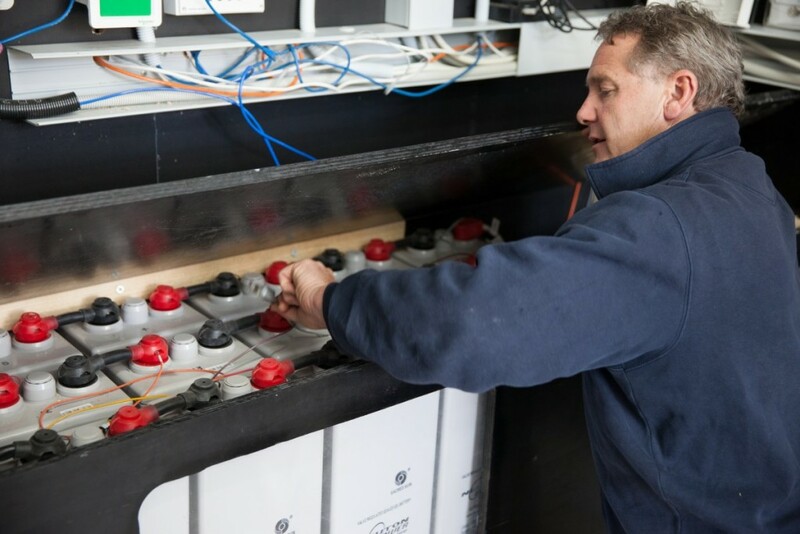 Ian fitting off the Victron Lynx 1000A busbar system for connecting batteries in parallel. 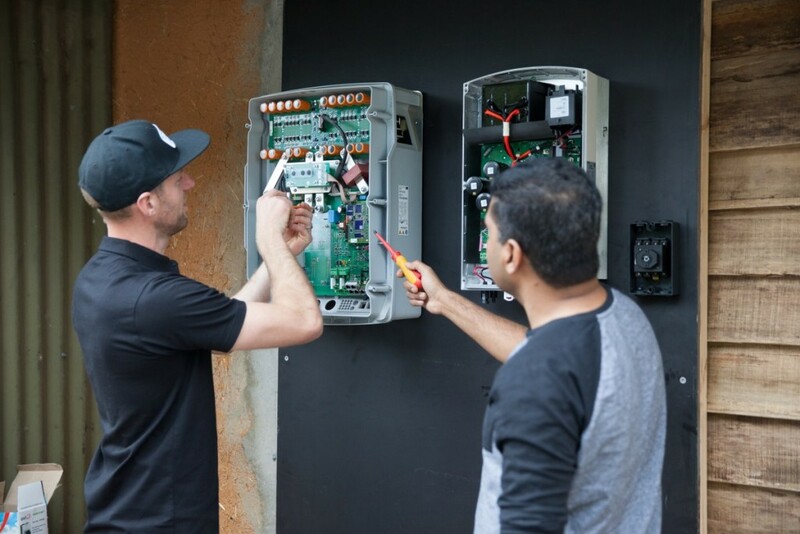 Matt & Munaz installing an off-grid SMA Sunny Island 8.0H-11 battery inverter with a SolarEdge SE3500 grid-connect inverter set to respond to frequency dependant power reduction signalling from the Sunny Island. 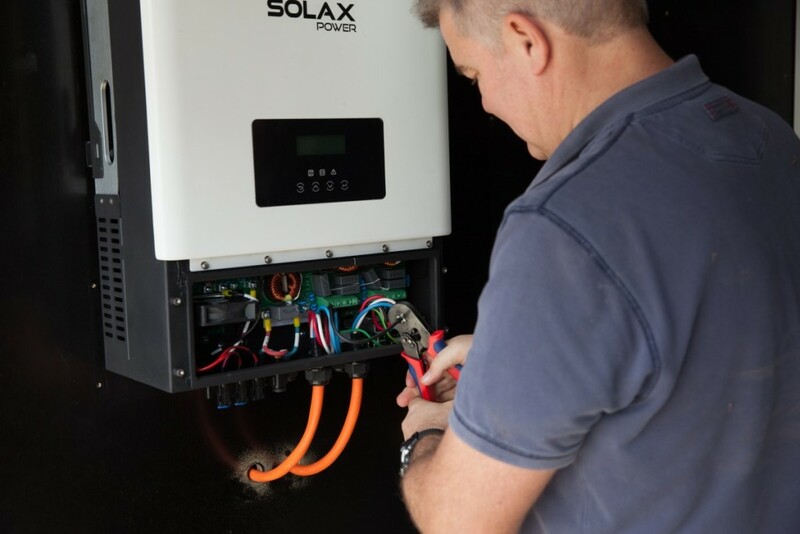 Coen installing the new (second one ever made) SolaX X3 Hybrid inverter. This unit is the 10kW variant. 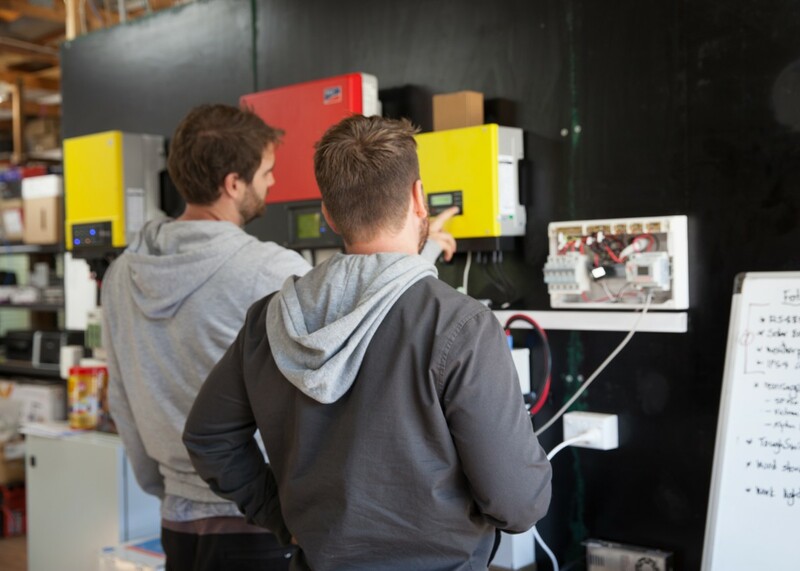 These amazing inverters can be connected to up to a 500V d.c. battery and have a total of ten inverters operating in unison using just a single power meter connected to the master unit. Unbalanced 3phase load support is also unique. Ian checks out the Neuton Power VRLA 600Ah lead-acid battery pack. Senec energy storage and trading system from Glen Morris on Vimeo. Ian from Senec explains how their energy storage product, with over 13,000 already installed in Germany, is challenging the way we think about energy and currencies. Paul Wilson of Arvio with Super Capacitor System from Glen Morris on Vimeo. 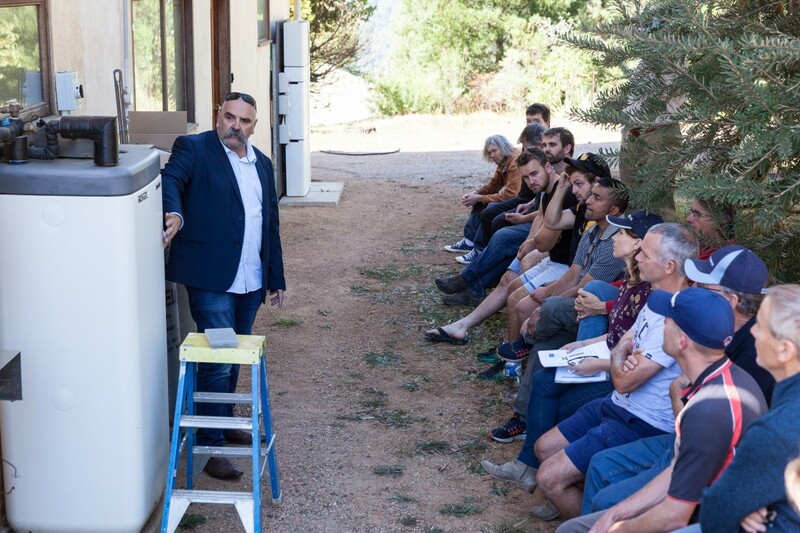 I love how Paul tells the story of energy storage, “once upon a time we used to use old technologies like lead and lithium, now we use super capacitors”. It really does feel like super capacitors have appeared as a viable option for hybrid applications, and with some pretty awesome specifications. Catherine von Burg CEO of SimpliPhi at All-Energy from Glen Morris on Vimeo. Every battery has to have an edge and SimpliPhi Power has many: 15 years experience with lithium battery manufacture and deployment; adoption by the US Department of Defence for extreme environments; and the reliable choice for location power for many top film productions (Avatar). Paul Liddell from Redback from Glen Morris on Vimeo. 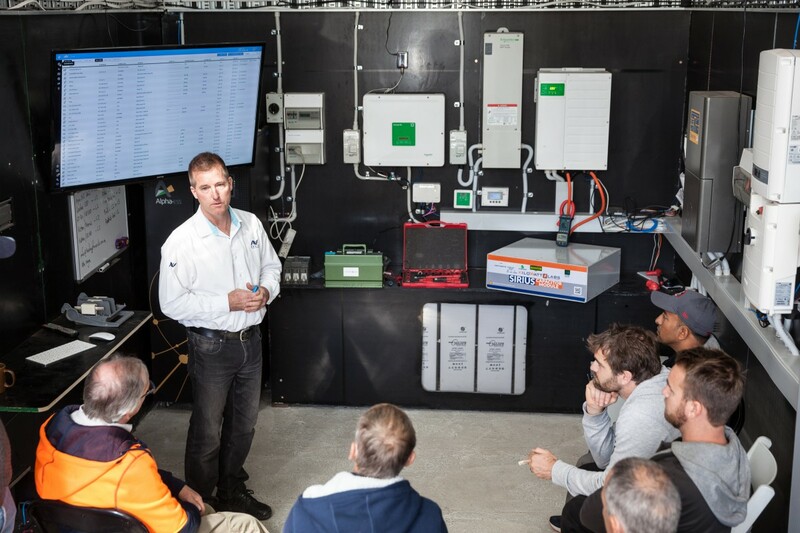 Redback have just released their “Gen2” SH5000 smart hybrid inverter. The main differences are a larger battery compartment and a new compliant integrated d.c. isolator – making for a very streamlined installation. John Wood of Ecoult with the UltraBattery from Glen Morris on Vimeo. Another great Aussie invention, the UltraBattery from Ecoult. Developed by the CSIRO and commercialised by Ecoult, this battery has some awesome characteristics – John Wood CEO explains. Bradley Paton of GenZ LFP battery manufacturer from Glen Morris on Vimeo. 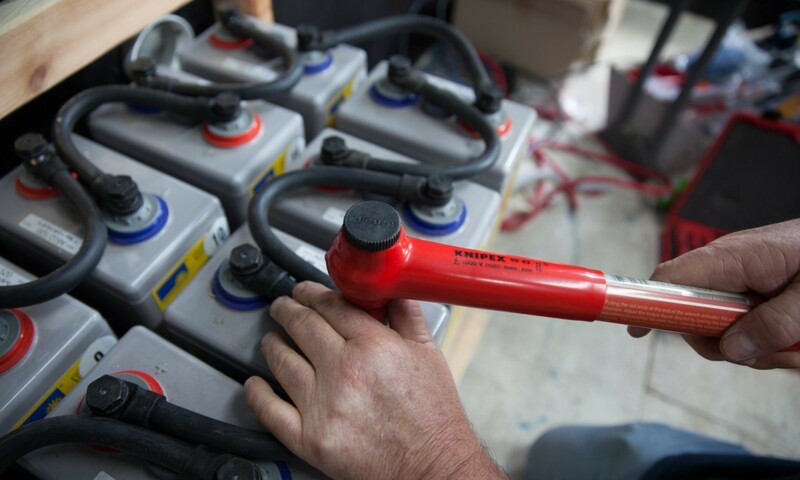 GenZ, an Australian designed LFP battery can be used as a direct replacement for lead-acid batteries as there are no coms required with the charging source – just voltage settings. Eclipse Solar GC Inverter designed and built in Melbourne from Glen Morris on Vimeo. Gary from MILSolar chats to Glen Morris about their new 5kW grid-connect inverter, designed and built in Melbourne, Victoria. Andy from Sungrow introducing their 250kW stand-alone inverter! from Glen Morris on Vimeo. This is one awesome stand-alone inverter! Will have AS/NZS 4777.2 shortly so can be used for peak lopping of grid supply too. Perfect for microgrids as well.